Osteoarthritis is a form of degenerative arthritis that occurs when the cartilage, a firm, rubbery material that covers and protects the ends of our bones, acting as our body’s shock absorber, breaks down exposing the bone. To make up for the loss of cartilage, bones can begin to grow outward and form painful bone spurs called osteophytes. Where Can You Get Osteoarthritis? Osteoarthritis (OA) is the most common form of arthritis, affecting one in six Canadians. It is known as the “wear and tear” arthritis and is most common in our major load-bearing joints: the hips, knees and spine. If you feel you may have OA of any joint, please seek an assessment from a qualified physiotherapist near you. Osteoarthritis is a degenerative condition meaning that the cartilage in the joint slowly breaks down and wears away. As osteoarthritis progresses, the cartilage becomes rougher and continues to break down, ultimately causing an overgrowth of the bone underneath. 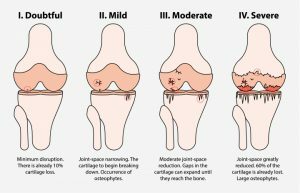 Osteoarthritis develops and progresses over many years, the progression of which is measured in four stages: doubtful, mild, moderate, and severe. 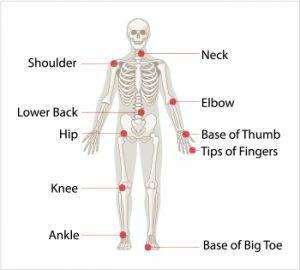 Common signs and symptoms of osteoarthritis vary depending on how far the condition has progressed and the joint affected. The most common symptom of osteoarthritis is pain around the joint. There is no cure for osteoarthritis, but there are several treatment options that you can follow to help manage your pain, improve your quality of life, and delay progression to later stages. Here we’ll explore the most common osteoarthritis treatment options, ranging from conservative to invasive. Depending on the type of osteoarthritis you have, an assistive device can be used to reduce the pressure and stress on the affected joint. A doctor, physiotherapist or occupational therapist can recommend which device is best for you and help fit it too. Pain management can be a necessary part of managing osteoarthritis. A natural, drug-free noninvasive means of treating osteoarthritis, physiotherapy prescribed exercises have proven effective in managing osteoarthritis pain at all stages. Physiotherapy focuses on improving your aerobic conditioning while also strengthening the muscles that support the affected joint. pt Health is the exclusive physiotherapy partner of the Arthritis Society. Learn More about our specialized arthritis and osteoarthritis treatment program. Concerned about osteoarthritis? Book an assessment with a physiotherapist today. Surgery is the most invasive way to treat osteoarthritis and should be considered as a last resort after trying other more conservative treatments. As with any surgical procedure, there will be a period of recovery during which a physiotherapist can work with you to help regain strength and restore range of motion to your affected joint. Can Osteoarthritis Go Away On its Own? No, as osteoarthritis is a degenerative disease, if left untreated it will continue to progress to later stages. While there is no cure for osteoarthritis, it can be managed effectively with physiotherapy and lifestyle changes. Yes, there are known risk factors for developing osteoarthritis and reducing or eliminating them can significantly lower your risk of developing some forms of osteoarthritis. Learn more about treatment and preventative care options for osteoarthritis here.